At Dispute Resolution Services of North Texas Inc., most of our mediations are designated as Level I. In a Level I mediation, two mediators (normally a male and a female) are assigned by the designated Case Specialist. The Case Specialist is the DRS North Texas staff person who handles all case management matters: scheduling, confirmations, case paperwork, assignment of mediators, and closing the case upon completion of the mediation. The mediators act as facilitators to encourage discussion and negotiation between the parties. 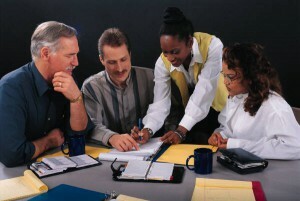 The co-mediation technique brings balance and diversity to the mediation process. Each mediator contributes his or her experience, perspective, communication style and creativity to the mediation session; this results in a high level of interaction, trust, and productivity with the participants. Our Level I mediations offer a high quality experience at a very reasonable price. By comparison Level II Mediation is slightly more costly. Click to learn more about Level II Mediation. Individuals interested in requesting a Level I Mediation with our office should submit a Request For Services Form. By clicking the button below, you will be directed to a page with information on how to initiate a mediation. If you prefer to speak with a staff person to request a Level I Mediation, please call (817) 877 – 4554.